The Menu Express printed Doorhangers. *All Doorhangers are premium quality 16pt / UV coated. 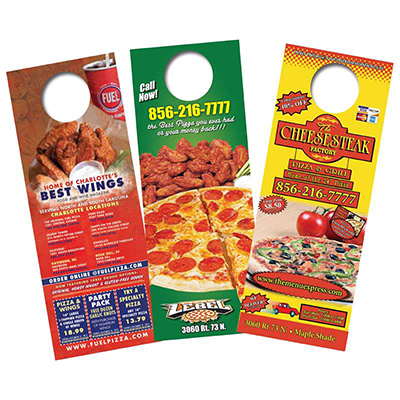 Door hangers are a great way to get the word out about your business, organization or event. Great for startups, fund drives, contractors and any business targeting a specific location demographic. They are commonly used for restaurant menus, coupon advertisements, services, products, or political campaigns. If you are a new local delivery restaurant you can cover your local delivery area with them. It's hard for people to miss a hanger on their door when they come home. Your high visibility message will be seen by your target audience. Door hangers are a great way to get immediate results. Consider adding a QR code to your design to maximize your marketing potential. Since a QR code links to your online message, you can change the online message without the need to reprint the QR code. Call us toll Free at 877-250-2819, To have your Doorhangers printed. To request your quote for Doorhangers, simply complete this form!